In 2015, I had the great pleasure of serving as Teaching Assistant for EVE 180: Experimental Ecology and Evolution in the Field at UC Davis. Experimental design in field ecology. Students will critique primary literature, design project, gather and analyze data. Students required to write original research paper based on field experiments. Involvement in the research process is imperative for undergraduates to understand the process and tools of science. Many undergraduates find opportunities to be involved in the research process by volunteering for labs. However, these experiences can be misleading representation of the research process - students are unable to engage with the research process from idea generation to data analysis and presentation of results. Many institutions work to remedy this situation by offering field courses, where students do independent research project. However, many of these courses fall short because of their short length. 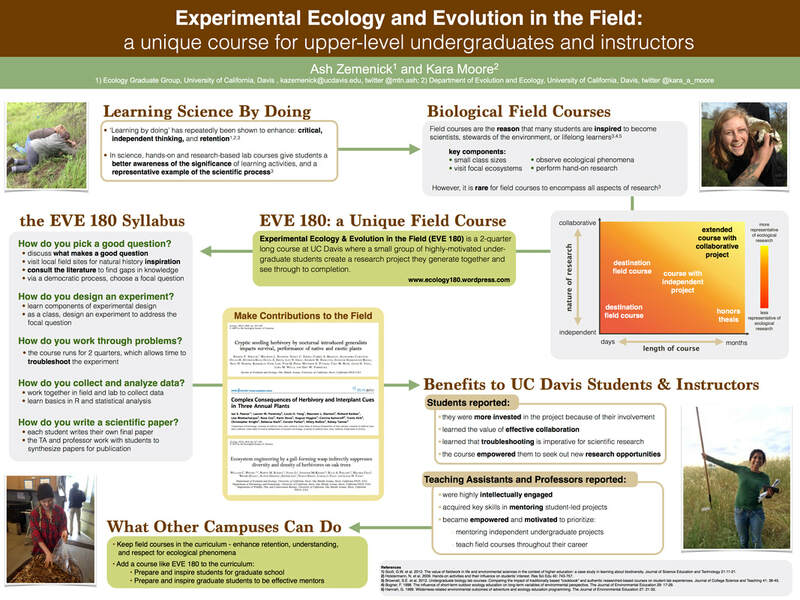 EVE 180: Experimental Ecology and Evolution in the Field is a highly unique class offered at the University of California, Davis to upper level undergraduates that is two quarters long. The goal of the course is for students to create a research project that they generate together and see through to completion. The course involves: Brainstorming ideas, discussing what is a good project, digging into the literature, seeing ideas unfold and take action doing experiments. We interviewed students, teaching assistants, and instructors to elucidate the value that EVE 180 has played for all parties involved in the course. All students reported that EVE 180 was a highly unique experience. In particular, five main values were reported: 1) students valued their ability to witness and engage in the whole research process from start to finish, 2) students consistently reported that they were much more invested in the project because of their involvement in it from the very start, 3) students learned that troubleshooting is an imperative skill for scientific research, 4) students learned the value of collaboration in scientific research and how to go about it, and 5) students reported that participating in this course has opened up new research opportunities for many of the students. ​ Former instructors were also interviewed. Teaching assistants reported that EVE 180 was an invaluable experience that taught them more about mentoring and teaching research skills than any other experience in graduate school. It motivated one teaching assistant to prioritize teaching field courses throughout their career, and motivated another to value mentoring undergraduates in their research endeavors. Finally, former instructors reported that teaching EVE 180 was highly motivating and intellectually engaging. Overall, students, teaching assistants and instructors of EVE 180 reported that this unique class provided them with invaluable experience in the scientific process.